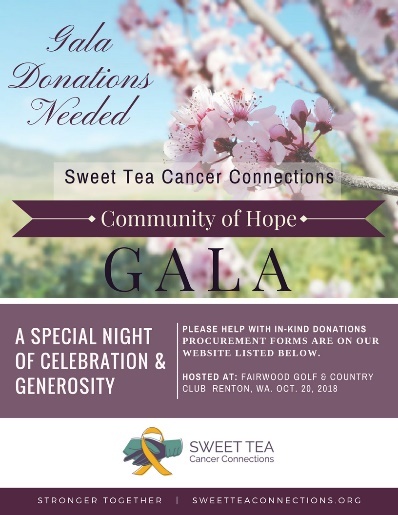 Sweet Tea Cancer Connections (STCC), invites you to be a part of building the world’s first, nonprofit mobile app to connect parents who have children with pediatric cancer. The app we are building and actively securing funds for is called Our Community of Hope. Unfortunately, over 300,000 children globally are diagnosed with cancer each year and must embark upon the challenging, and often, devastating, cancer journey. Parents and caregivers often fight the cancer journey in isolation due to confidentiality limitations and HIPPA regulations at hospitals where their children are being treated. Would you please consider supporting our event with a donation to our silent or live auction? All of the money raised during the event will go directly toward development costs for the mobile app. Tatum Fettig, Founder of Sweet Tea Cancer Connections, had her daughter's story featured on CBS television. Take a look at the little girl, our superhero, that inspired everything!